"Anthony enjoys the class and likes the teachers. He was happy every time after the class. He reads to me every week day and has tried to remember speeches assigned to him. ... Thanks a lot!" "My son loves the class delivered by Mr. Gilmore. The class was fun and exciting. All students were engaged and eager to come back every week. Thanks a lot. "Ida loves it and is learning so much. Thanks!" "Great class! student enjoyed it!" "Jodi has had an amazing experience with Rose Debate! I think it was well worth the money and the time. She very excited about participating next year! Thank you for providing a class that teaches children very useful life skills!" 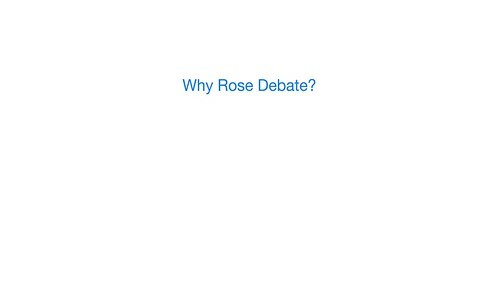 "Rose Debate's class was really fun and engaging. I learned a lot as a public speaker, and the tournament was REALLY well organized and enjoyable." "I absolutely loved Rose Debate's classes. Before I took the class, I was always stiff, shy, and scared of public speaking. Mr Rose's classes dissolved my fears and made me a more confident individual. Not only did I learn to become a better public speaker, I learned to become a better person as well." This class was absolutely wonderful for our students! The kids, parents and teachers love Paul Rose! He is extremely smart and treats every student with the utmost respect. Several families at our school have written to me and visited my desk just to tell me how helpful this course was for their child. These kids have gained so much confidence and learned valuable techniques that turned them into amazingly effective public speakers! When a teacher assigns a project that includes a presentation, many students know the material and have spent weeks preparing but when they're in front of the class, it's not obvious because they are so nervous. By practicing the art of public speaking in a positive environment, they are well-equipped to shine during these class presentations. The adage "it's not what you say but how you say it" really holds true when you realize that you have become an effective communicator. Your child will have more success academically and improve their interpersonal relationships. It's worth every penny! – Megan Kennedy, After-school coordinator, Jackson School, Newton, MA. students are eager to attend and return each year." highly recommend them to any school looking to improve its students' public speaking skills."